After a short break we are back to the pleasant task of finding a nice place for a weekend getaway. This week we are taking you to a small town, about which you can only hear praises. You know those conversations when people decide that they have to name the most beautiful place in the country? Then arguments arise, everyone talks without listening, and no real decision is taken. Anyway, in situations like these, there is one Bulgarian town, about which no one is able to say one bad word. It is called Tryavna. Tryavna is a town in central Bulgaria, situated in the north slopes of the Balkan range, on the Tryavna river valley, near Gabrovo. It is famous for its typical National Revival architecture, featuring 140 cultural monuments, museums and expositions. Houses from this period have their own architectural design. The ground floors had irregular forms and housed craftsmen and traders. The upper floors featured wooden bow-windows, the roofs were covered with well arranged rocks. Tryavna is a small (12,226 inhabitants) but unforgettable place. The town square, named Capitan Diado Nikola, with the clock tower, dating from 1814, is the most prominent place of interest. You can see the same tower in almost all souvenirs they sell here, it is something of a town symbol. Another symbol is the St. Archangel Mihael Church, situated in the town center and built in the late 12th century after Bulgarian tzar Asen defeated Byzantine emperor Isaac II. The unique Museum of Asian and African Art is housed in the old public bath, on the riverside. 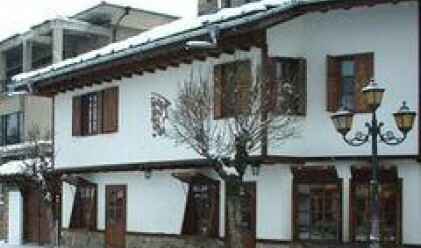 Tryavna is proud with its great samples of the woodcarving, icon painting and original architecture. Today the town is a preferable tourist spot, featuring modern hotels, private lodgings and villas, restaurants and taverns. There is also a Renaissance Art school where successors of the old icon painters and woodcarvers master these crafts. Many tourists are tempted to stay in the beautiful hotel called Art-M and situated at the old square we already described. It is more of a guest house, which accommodates up to sixteen people and is part of the Authentic Bulgaria selction of hotels we are presenting in this column. It was built just two years ago and replaces an old house, which was completely destroyed in a fire. The interior is especially designed to recreate the style of the Revival Period in unison with the atmosphere of Tryavna. The name itself suggests that it is not only a place for accommodation. Well, the hotel is famous with Art-M gallery. Actually the gallery was created first (1990) and the hotel was built after (2006). It comprises three sections. In the first two you can see works of Bulgarian artists, the third hall hosts a unique exhibition of relligious paintings. Rooms in the hotel cost just 30-35 leva per night per person. So, there is nothing to think about. We suggest you follow our advice and take the trip there immediately. And if you are curious to learn more about the beautiful places in Bulgaria and especially about the hospitable Authentic Bulgaria Hotels, join us again next week for some more travel.